You are now easily able to spot high-level trends using our revamped HRV graphs! 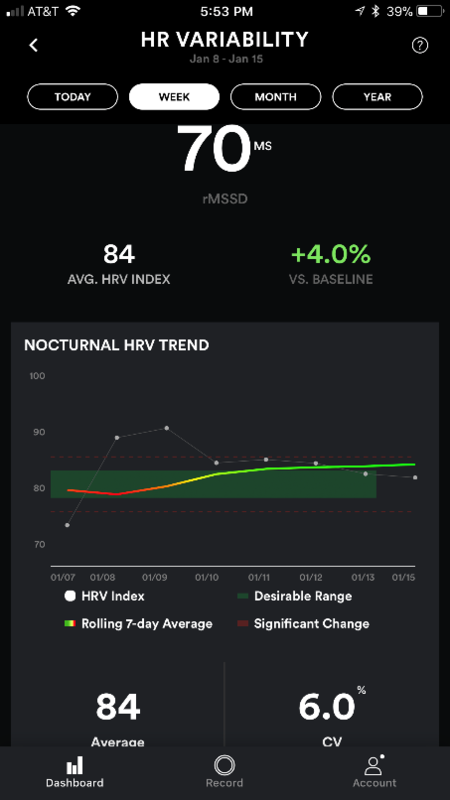 We now use "Nocturnal HRV" to determine your HRV for the day instead of average. Nocturnal HRV is measured toward the end of your sleep right before you wake up. We've also introduced the concept of "HRV Index", which is a normalized HRV value on a Natural Log scale, allowing easy spotting of significant changes. Since HRV is affected by a variety of factors (e.g., movement, light, noise, temperature, food, and fluid ingestion, etc. ), sleep theoretically represents the optimal condition for HRV assessment. Biostrap uses median of last 5 HRV readings just before waking up as a Nocturnal HRV. 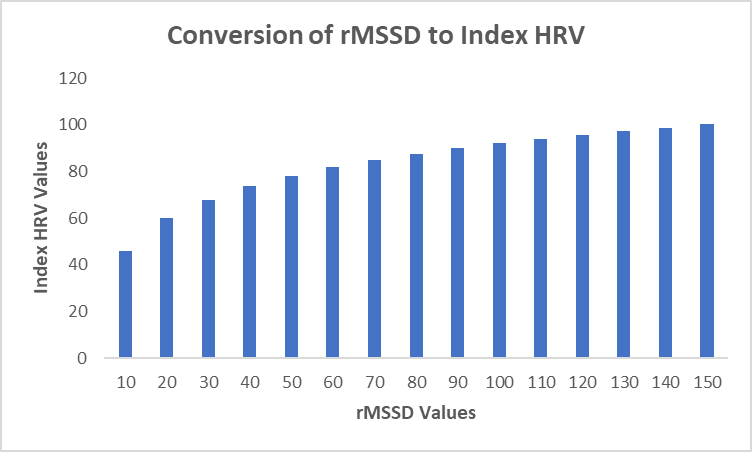 HRV Index is a derivative of rMSSD HRV number. The following bar graph shows the relationship of Index HRV Values with respect to rMSSD Values. Basically, HRV Index reduces the disparity between the rMSSD values. How this is displayed in the app? Green Section of the Graph: This is your desirable range for daily HRV Index values. You want your daily HRV Index values (as shown by white dots) to stay within this region. CV (Coefficient of Variance): This number tell how resilient you are to changes (physical, psychological, emotional, etc). The lower the number, the more resilient you are. Trending Graph: The green and red line graph shown above is your trending graph. When this graph goes near the lower limit of the green region, it changes color to RED, thereby indicating it's time for intervention. Daily Changes: This method involves reducing training intensity when the daily index HRV (shown as white dots) value is below baseline. Generally, the individual would opt for a rest or active recovery day when Index HRV is below baseline for a second consecutive day. Higher intensity training would be planned for days when HRV Index is within or above baseline. This method has been shown to be superior for improving markers of endurance performance than traditional pre-planned training. Trend Changes: Normal training would be performed as long as the trend-graph remains within baseline. This means that isolated Index HRV values below baseline would be ignored as long as the trend is within baseline. This is why it is considered “less reactive” to use this method. However, when the trend falls below baseline thresholds, training intensity is reduced until the trend returns. This method has also been shown to be superior to traditional pre-planned training and is more commonly used with athletes.